I had such an amazing time in Hawaii on The Big Island celebrating Si's Birthday. Thank goodness the iPhone captures great quality video because we were able to create this montage that shows the beauty of the island and some of our adventures as well! We collaborated with and stayed at the Sheraton Kona and can't wait to go back to visit. I hope you enjoy our ELEVATE! Hawaii Montage (Watch in HD)!! Be sure to subscribe to our YouTube channel too!! This post is sponsored. As always, all opinions are mine. When Si, decided that we should go out of town to celebrate New Year's I was completely down! Now, when he said Chicago as the destination, I was hesitant because he's knows I don't like the cold. After searching for hotels, he suggested we stay at the Wyndham Grand Chicago Riverfront. He sent me some pictures of the property, and I immediately said, "YES!" What made me throw away all my thoughts of the cold weather - this view! The Wyndham did give us some perks for choosing them, one of them being a high floor corner room with the river view. Be sure to select a room or suite with a river view when you book your room at the Wyndham Grand Chicago Riverfront. I am a sucker for a beautiful, scenic sunrise and sunset, and if you are too this room type is a must. This luxury hotel is located in the heart of downtown Chicago and has easy access to public transit if needed. It is less than half a mile from Millennium Park and the shops of Michigan Avenue/Magnificent Mile. 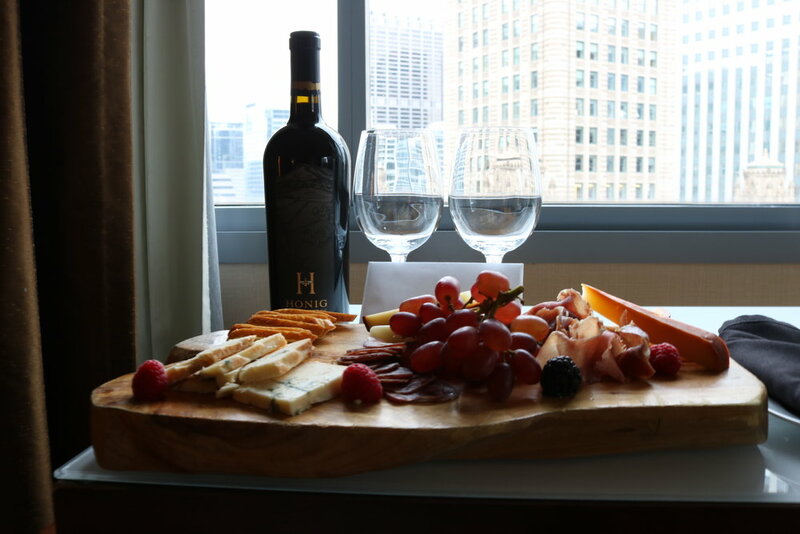 Upon entering our room we noticed a meat & cheese tray and bottle of wine accompanied with a welcome note. Our room had a comfy King bed, mini refrigerator, large flat screen, and lots of space! For no additional charge, you can request a microwave if needed. 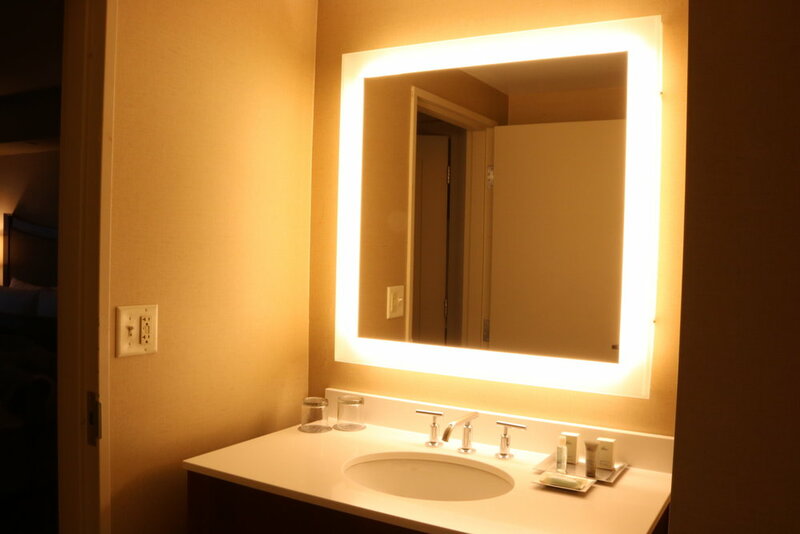 The bathroom features a lighted vanity mirror which I know all of the ladies will appreciate! Downstairs attached to the lobby is Hoyt's, an American tavern featuring Mid-West comfort food. Hoyt's offers breakfast, lunch, and dinner along with weekend brunch. Because who doesn't love Sunday brunch?! Pictured below is my tasty 7oz. tenderloin and mashed potatoes. I will share my detailed experience from Hoyt's in a Tasty Tuesday post, but just know that I was very pleased. The hotel has a gym for those wanting to stay fit during their stay. While using the gym's amenities (free weights, treadmills, ellipticals, etc) you can enjoy a view of the Chicago River. If you are able to make your way to the penthouse, I highly recommend it. The top floor has breathtaking views that you will want to see. It also has an event space both indoor and outdoor for those wanting to host an event for a special occasion. If you follow me on social media, then you know we were supposed to leave on January 2nd but changed our flight so that we could stay one more day. The Wyndham Grand Chicago Riverfront helped me fall in love with the Windy City, and I cannot wait to go back! Have you ever been to Chicago?! If so, please share some of your places to visit, because I will be returning hopefully in March!